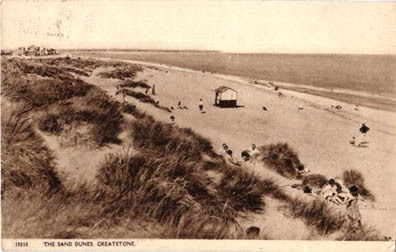 the O Dreamland guide to Greatstone. (guide measures 26.5 x 12.5cm). 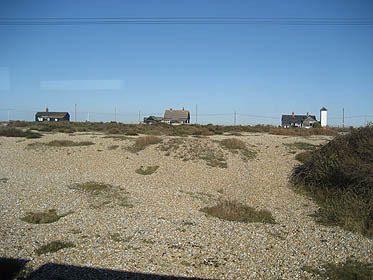 The centre of the O Dreamland project is Greatstone which is between Littlestone and Lydd-on-Sea and a short distance from Dungeness on the Kent coast. 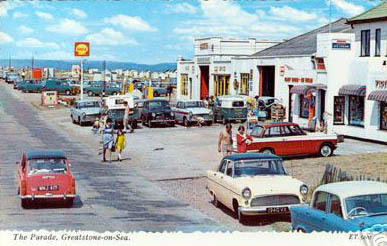 Greatstone has a mixture of 30s houses, bungalows and a few shops, cafe's fish and chip shops and pubs. On a clear day the French Cote d'Opale can be glimpsed from the village's greatest asset - its sand dunes and huge empty beaches. The Romney Sands Holiday Park in Greatstone is also the location of one of the stations on The Romney Hythe and Dymchurch Railway, the world's smallest public railway which will take you from Dungeness to Hythe. The final stop on The Romney Hythe and Dymchurch Railway. Dungeness has an eerie end of the world atmosphere and was home to director Derek Jarman who featured it as a location in some of his films and created a famous shingle garden outside his cabin. Dungeness has a lighthouse which you can climb and nice fish and Chips at The Britannia and The Pilot. Oh and there is also a nuclear power station. 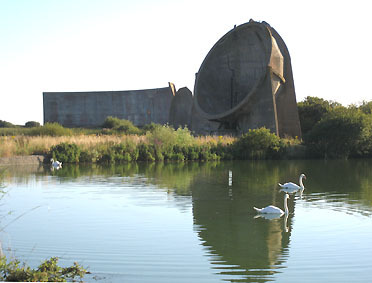 Also worth visiting is the RSPB nature reserve on the road between Dungeness and Lydd. It has really amazing binoculars that you can try out in the shop and then you can visit lots of little hides and spy on birds on the lakes. Beautiful little walled town with lots of nice places to stay, restaurants, shops etc. Fantastic sandy beach with bucket and spade shops. Used as a location for the film Carry On Follow That Camel. A very grand place to visit around the 1900s which has resulted in a legacy of magnificent cliff top buildings and a promenade called the The Leas. 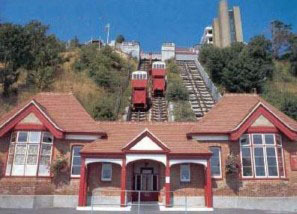 There is also a cliff lift which works by using changing weights of water, a zigzag path down the cliffs and at the bottom a wonderful walk through landscaped gardens and bits of adventure playground (great for kids). On the other side of the town, the area around the old high street has become the new Creative Quarter and is home to galleries, coffee shops and other creative businesses including the B&B Project Space (showing Matt Rowe's Where Has all the Good Time Gone for O Dreamland)and Rennies seaside modern a fantastic shop run by O Dreamland participants Karen and Paul Rennie. This is a huge caravan site very close to 202 The Parade. Very nice small b&b overlooking the sea close to 202 The Parade. Nice small b&b ten minutes walk from 202 The Parade. This secluded house on the sea front was built in the 1920s for the American film actress Hedda Hopper, who later achieved notoriety as a Hollywood gossip columnist. The architect was Sir Clough Williams-Ellis, creator of the famous Italianate village of Portmeirion in North Wales. It was originally painted bright yellow, and was nicknamed the 'Mustard Pot'.